One of my favourite things about my Beauty Therapy days (besides all the skincare knowledge) has to be all the amazing smelling products that came with it. Whenever I find something remotely similar, it pulls me into a wave of nostalgia and I instantly feel relaxed like I am getting a massage all over again. Isn't it crazy what effects certain smells can have on you? Recently, I was offered to try some of the Made By Coopers range. Of course I couldn't say no as anything that Aromatherapy based, I am there. I was very kindly sent 3 different products so I am here to tell you all about them and why you need them! 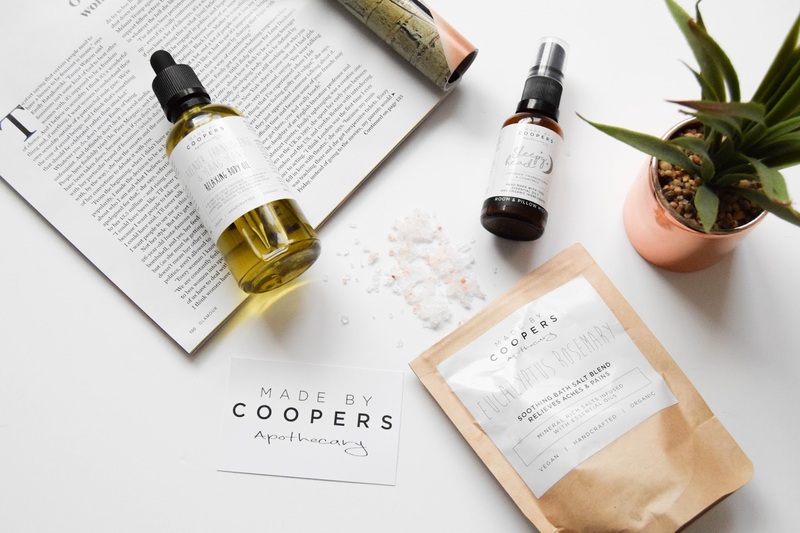 Made By Coopers was founded by Surrey based husband and wife, Clare and Darren Cooper who create aromatherapy products such as candles, mists and all the spa goodness. All of which are 100% natural and contain no artificial colours or fragrances. To make it even better, the entire collection contains no nasty ingredients, are 100% vegan, natural, cruetly-free and ethically sourced. Guilt free products are always the one! 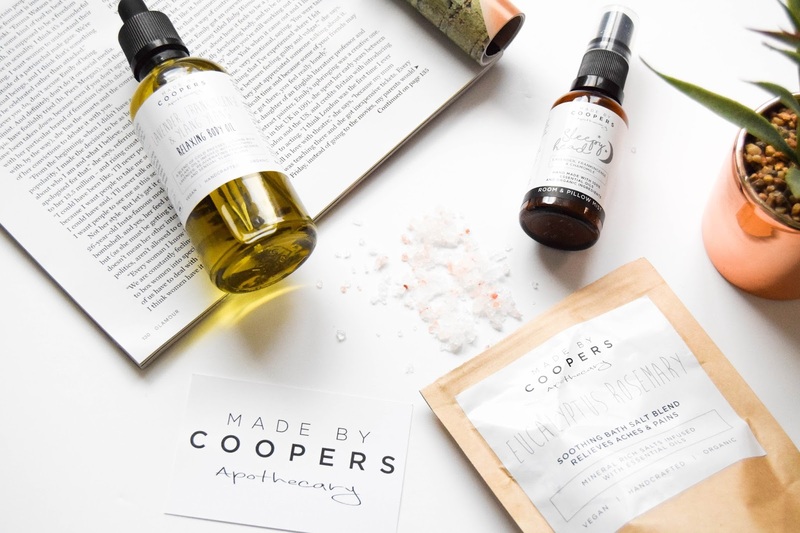 The first thing I want to talk about is the Made By Coopers Travel Sized Sleepy Head Room & Pillow Mist* (£6). I'm not usually susceptible to sleep sprays but this genuinely works wonders with me. Lately, I've really been having trouble sleeping, so this couldn't have come at a better time! 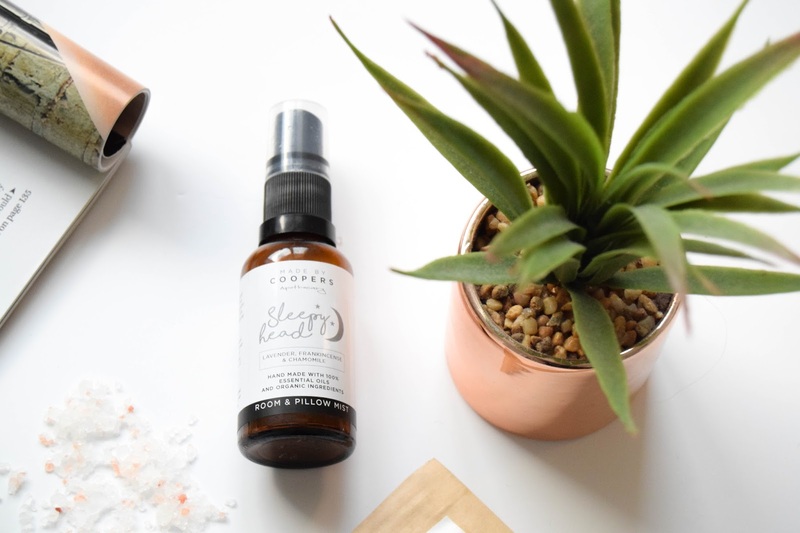 This spray has Lavender, Frankincense and Chamomile in which is the perfect combination for a stress-free, calm environment to give you a good nights kip! I spray this all over my bed sheets, pillow and a couple of sprays around the room. Once I've done this, I usually nod off within 10 minutes! The packaging is so adorable, not fussy and sophisticated. I'm actually obsessed with how cute it is. It comes in 30ml glass bottle and is perfectly compact if you're someone who travels around a lot. It's also way within the guidelines UK hand luggage too! As for price, I expected this to cost a fair bit as the quality is so good but it's only £6! Considering I've used this every night for the last 2 weeks, it not even a quarter of the way down yet. I love it! 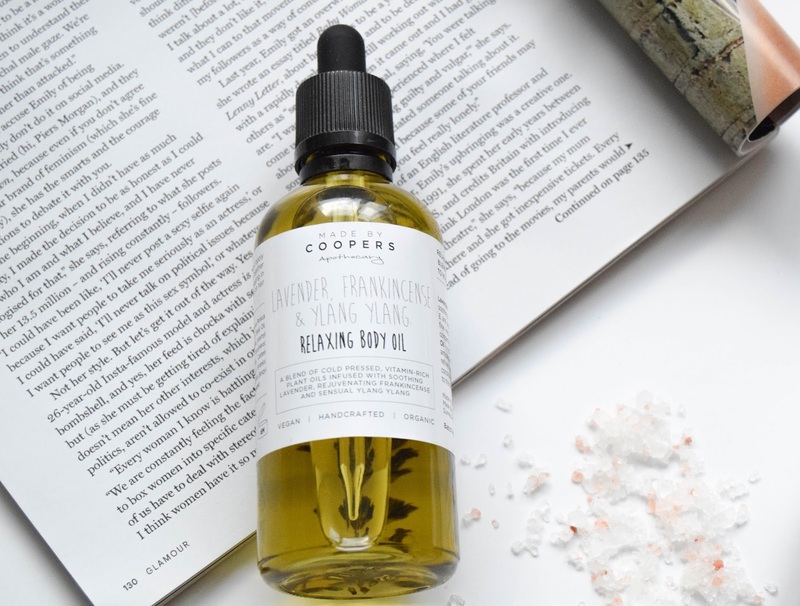 Next up is the Lavender, Frankinsense & Ylang Ylang Relaxing Body Oil* (£20). This stuff is essentially a spa in a bottle. 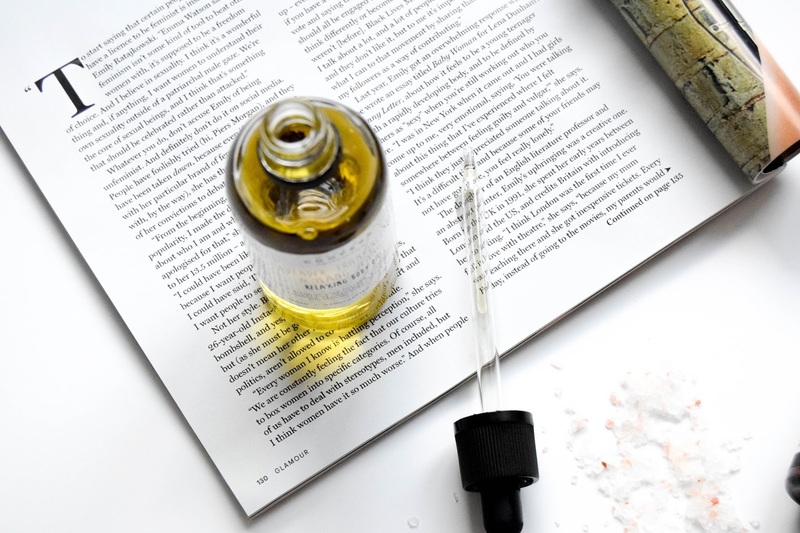 In the last year, I've much preferred body oils to moisturise with as they last a lot longer and feel that little bit more luxurious on skin. This comes with a pipette so you can get the product out with ease, which I love because you don't overdo it leaving yourself a slippery mess! This smells very soothing, massages nicely into the skin and doesn't take too long to absorb into the skin. The oil is also infused with plenty of vitamins to help keep your skin in tact. Not only that, it's a multi-purpose product as you can also use this for your hair and nails too. There are plenty of benefits that come from using this, including the reduced appearance of fine lines and wrinkles, helping to repair dry skin and clearing large pores. Last but not least is the Travel Size Eucalyptus Rosemary Bath Salts* (£5). I want to start by saying this has a very strong scent (I'm talking Vicks), which I can't imagine will be to everyones taste. However, I think the stronger the scent, the more positive effects it has on your body. Considering this is travel sized at 100g, it is definitely a generous little package. Again, I love how simple the packaging is, yet how chic and sophisticated it looks at the same time! I also like the fact there are 2 different sizes to choose from which is great if you wanted to try something out but not pay full price for the larger one if you weren't too sure. As for the salts themselves, a nice sized handful dissolves really well under running water and it doesn't take long for the scent to takeover your tub. They also include plenty of healing properties which can help to soothe aches and pains, help to repair damaged skin and contain natural anti-inflammatories. All of that, as well as helping you to relax and unwind in the comfort of your own home. I'm waiting to put these to the test aches and pains wise, so I will be updating this post as soon as I'm having one of those days. Now winter is coming (lol) I will certainly be having more baths so I'm very hopeful these will work next time I feel achy! Personally, I am obsessed with this range and there's no better feeling than being able to bring that spa feel into your own home. I can't wait to try more of this range - I already have my eye on all of the candles! 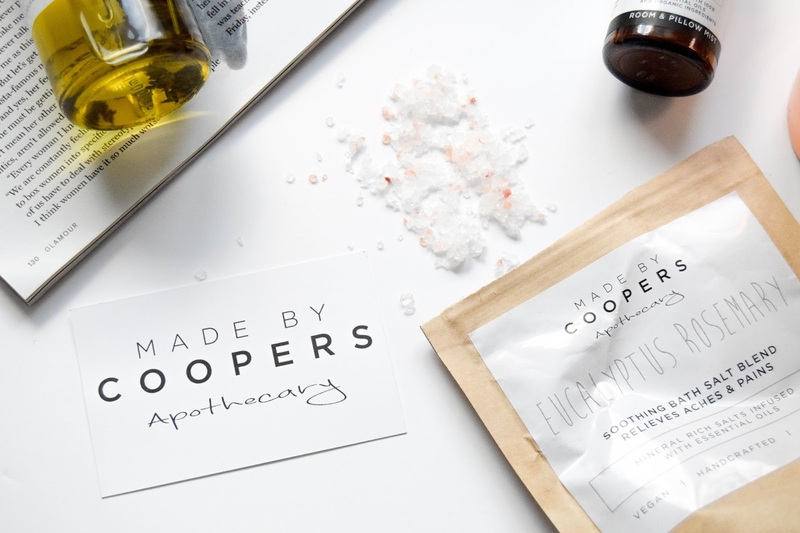 Thank you so much Made By Coopers - I will be recommending you to all of my friends! That room mist sounds perfect. I'm such a fan of products designed to help you sleep! Never heard of this brand but they packaging is fab!! I usually moisturise with body lotion but I'd deff be interested in giving the body oil a try! Amazing photos btw! Great post and thank you for sharing it with us. Never heard of the brand but it looks great! I will give them a try soon!